Appear TV’s new transcoder solution, SD/HD Transcoder, is able to transcode AVC to MPEG-2, MPEG-2 to MPEG-2, MPEG-2 to AVC, and AVC to AVC. The trascoder operates in four different encoder rate control modes: Constant Bit Race (CBR), Variable Bit Rate (VBR), Capped Variable Bit Rate (CVBR), as well as Statistical Multiplexing (future release). 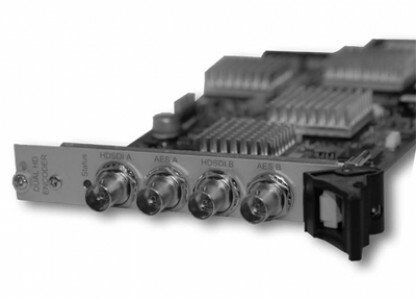 The multi-format transcoder module fits into the DC1x00/SC2x00/MC3x00 chassis and can be used in combination with any input and output modules available, thus eliminating the need for an external transcoder unit.